Kathmandu: Police fired into a crowd of demonstrators in Nepal on Sunday, killing one, with tensions running high as the Himalayan nation prepared to adopt a controversial new constitution. The new charter, aimed at cementing Nepal’s transformation from Hindu monarchy to secular democracy, was expected to come into force later Sunday after a deadly quake in April prompted rival political parties to end years of bitter disagreement. Lawmakers adopted the bill on Wednesday despite weeks of violent protests that left more than 40 people dead, among them two children and a police officer who was lynched as he was driven to hospital in an ambulance. It will divide the country of 28 million people into seven federal provinces, a move aimed at devolving power from the centre but which some historically marginalised groups say will leave them under-represented in parliament. They include the Madhesi and Tharu ethnic minorities who mainly inhabit Nepal’s southern plains, along the border with India. Authorities in the southern district of Parsa said police opened fire on a crowd of demonstrators on Sunday after thousands of Madhesi demonstrators defied a curfew to protest. “One person was killed when the police were forced to fire after thousands came out in the street defying the curfew,” Parsa’s chief district officer Kesheb Raj Ghimire said by phone. The situation was relatively calm in Kathmandu although there were a handful of protests early on Sunday by political groups opposed to the constitution. There was a heavy police presence across the capital ahead of a ceremony in parliament where the president will formally promulgate the constitution. It is the first to be drafted by democratically elected representatives of Nepal’s people and follows a decade-long Maoist insurgency aimed at abolishing an autocratic monarchy and creating a more equal society. Constitutional experts say it includes some progressive measures including provisions for improving the involvement of low-caste groups, women and minorities in national politics. But there has been strong opposition from some quarters, including Hindu groups who do not believe Nepal should be a secular state. Rights groups say it discriminates against women by making it more difficult for them to pass on their citizenship to their children than it is for men. 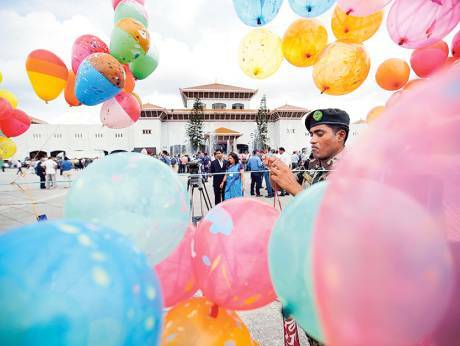 Nonetheless, many in the capital welcomed the new constitution’s introduction. “We have waited for this for so long. I am happy today, but there is also a sense of sadness because we have seen so much violence in the last weeks,” said finance worker Nabina Ranjit, 27.